At-home blue light therapy is a form of LED light therapy that has quickly grown in popularity in recent years. The kind of technologies we would once need to see a specialist for have become compact enough to be used at home. We believe blue light treatment is an ideal solution for removing pimples, whiteheads, and blackheads as it is highly non-invasive, causing no damage to the surrounding skin, is completely painless and effortless and has no adverse side effects. When strong blue light reaches the sebaceous glands in the skin, which are responsible for producing oil, it activates and excites porphyrins (a biological compound within acne-causing bacteria). Once activated, the phototoxic effect on porphyrins kills the acne bacteria from within. Alongside blue light, red light is also useful for reducing the amount of inflammation and speeding up the healing process. Other frequencies of light may also inhibit the production of oils from the sebaceous glands, further reducing the chance of developing acne. Though acne light therapy has been demonstrated to work, it is not fully understood how the spectra of light used in LED light therapy act upon the skin to reduce acne, however, the clinical effects are undeniable. At home blue light therapy devices generally require sessions of around 10-15 minutes twice a day for maximum results. Protective safety glasses are recommended for using this device as the concentration of light may damage the retina. We think it is best to use blue light therapy in conjunction with other acne treatments, as targeting acne and blackheads from multiple angles gives you the best chance at success. So here is our list of the best at home blue light therapy for Acne devices. Our reviewed led light therapy products have been selected by many factors such as effectiveness, value for money, safety and ease of use. We hope that you find the right led light treatment for you. The Sirius Nova Advanced Rejuvenation System is a handheld light therapy device which incorporates LED light therapy technology for a durable, efficient and effective system which will last up to 10,000 hours. Sirius Aurora is the only handheld light therapy device we reviewed with three interchangeable light therapy panels for treating a variety of conditions. The green panel is specialized for hyperpigmentation, the red for anti-aging/skin healing, and the blue is for acne. This light therapy system is can be used for a multitude of skin ailments and was developed to be easy to use at home. The Sirius Nova Advanced Rejuvenation System offers high flexibility in functionality with some useful features to personalize your treatment. The treatment panels can be set to either continuous or pulsating modes. The continuous mode is best for a quick, intense treatment. The pulsating mode is designed to prevent overheating of the skin which may cause discomfort. This device also includes a timer with an automatic shutdown option. This will prevent you from accidentally applying the treatment for too long and causing overheating of the skin and wasted time. This process of automation makes the device much easier and safer to use than some of its competitors. The treatment panels have a large surface area which increases the speed of treatment and provides more consistent coverage of the skin. The modular design across the three treatment panels allows you to personalize your treatment by providing light therapy coverage in different areas of your face with different skin conditions. For example, the blue light may be targeted at the T-zone where acne and blackheads are more prevalent and the red light around the eyes where wrinkles may appear. We believe the Sirius Nova Advanced Rejuvenation System to be one of the more intuitive and effective light therapy products on the market today. Its design allows for personalized treatments and comfortable use. One small disadvantage of this product is that if it is overused, it may cause a slight swelling of the face in some people due to the heat. Therefore it is important to read the instructions carefully before using any of these products. The TANDA Clear Plus Professional Acne Clearing Solution Device is one of the only light therapy devices designed specifically to target acne and blackheads. 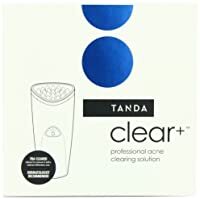 The TANDA Clear Plus Professional Acne Clearing Solution Device is the only light therapy device we have reviewed that incorporates sonic vibration and gentle warming in conjunction with bacteria-destroying blue light. The sonic vibration and gentle warming features are designed to stimulate and increase the activity of compounds within the sebaceous gland. When this stimulation is with blue light, a greater number of acne bacteria are killed, and your chances of acne and blackheads appearing are reduced. Due to its refined design, TANDA claims this model is able to target a narrow spectral range of light for the killing bacteria. This results in a product which causes less irritation, less redness, and less dryness. As well as treating blackheads and acne, this product also claims to be able to effectively treat fine lines and wrinkles within two weeks of treatment starting. It is great to know that while you are treating your acne, you may also be improving the appearance of your skin. One disadvantage of this product is that the treatment panel is slightly smaller than other models. This means that covering a wider area requires a longer application. 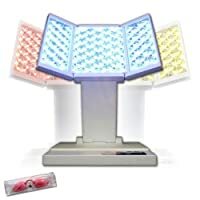 If you are looking for a blue light therapy device dedicated to the removal of acne, then this may be the product for you. We regard the NORLANYA Photon Therapy Facial Salon Skin Care Treatment Machine as the best commercially available standing light therapy device. This product is in the mid-high end range of light therapy devices, and this is reflected in its high-quality treatments. This light therapy device has no problem with coverage due to its full face center light panel and adjustable two wing light panels. The full face effect of this device allows it to offer potential benefits which handheld models are not capable of such as full face stimulation of collagen production, reducing the appearance of wrinkles across the whole face. The design of this product can supposedly also increase skin elasticity and improve the face’s circulation for faster healing. This system comes with three easily changeable light wavelength settings Red Light (630nm), Blue Light (470nm), and Yellow Light ( 590nm). This allows for personalized treatment plans which target a range of skin conditions over the whole face. The system comes with five pre-programmed settings. Blue light, red light, yellow light, program 1 and program 2. Program 1 is set up to provide treatment for daily care in both the spring and summer months. Program 2 should be used for the autumn and winter months, also at daily intervals. These preprogrammed settings are changeable on a light display at the base of the device, making this light therapy device intuitively simple to use. This system is easily transportable through a folding mechanism that also allows for efficient storage when not in use. The only disadvantage of this product is that it requires you to be fully facing the machine, stopping you from being able to multitask with another activity. However, putting in your headphones and drifting away while your acne bacteria are being destroyed may be a relaxing way to spend a few minutes of your time. Although more expensive than some other blue light therapy devices, we believe the NORLANYA Photon Therapy Facial Salon Skin Care Treatment Machine makes up for it through its claimed ability to generate fast effective results. If you have a serious problem with acne and blackheads or are committed to clearing up your face, then this could be the product for you. Interesting post! It is facinating that different light waves have unique positive effects on the skin. Light therapy seems like a great multifaceted approach to general skin care. Thanks.